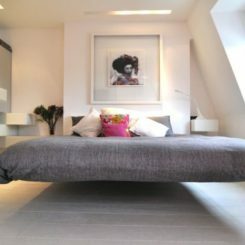 A new twist on a basic design idea, floating beds are an eye catching focal point. 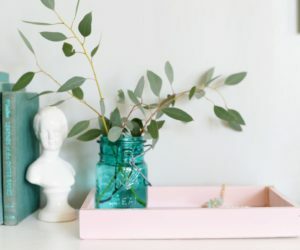 Most often associated with modern interior design, they can be a fresh addition to your home, no matter what your style. 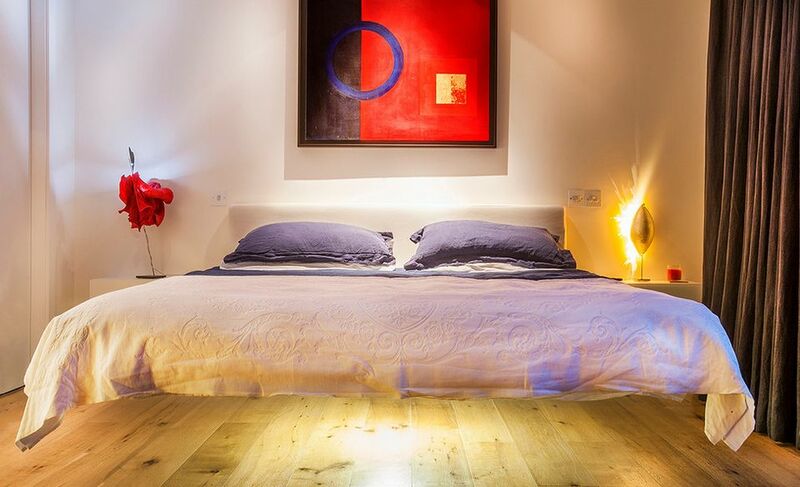 Instead of a large headboard, the artwork above this floating bed is the focal point. By opening up the space around the bed, it’s easy to admire the h rug as well as the parquet floor pattern. 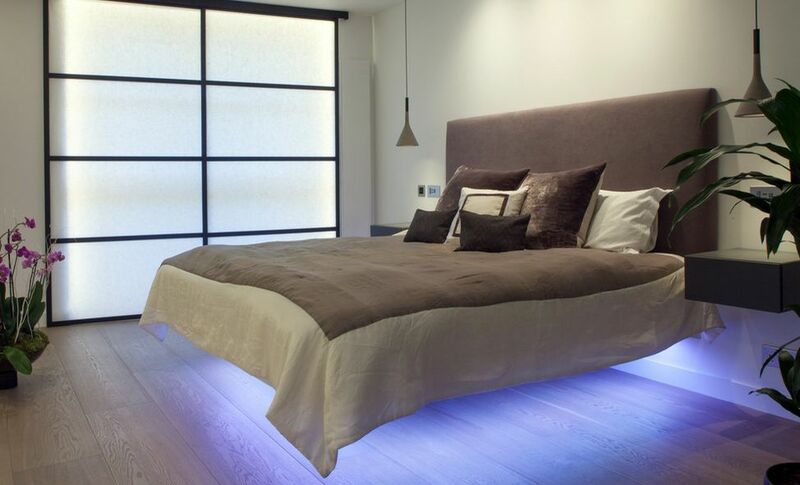 These beds take advantage of a platform-type bed, most often with added underlighting, to make it seem as if the bed is floating. The means of support are not readily visible. 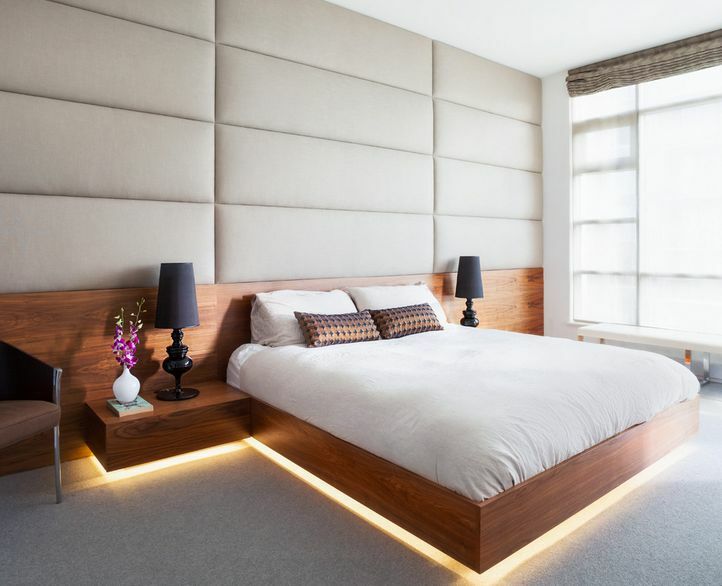 In this modern and masculine design, the decorative crossbar under the head of the bed is lit from underneath, which highlights the bed’s lack of visible support. While most beds consist of a mattress and a box spring set on a frame of some type, the platform bed uses a sturdier frame and eliminates the need for the box spring. The origin of the platform bed is hard to pinpoint. From the earliest days of man, people starting looking for ways to put distance between themselves and the cold, hard ground when they slept. The first known descriptions of platform bed construction were found in ancient Egypt, according to . Over time the concept evolved over time, until the modern box-spring was invented in the 1860s. 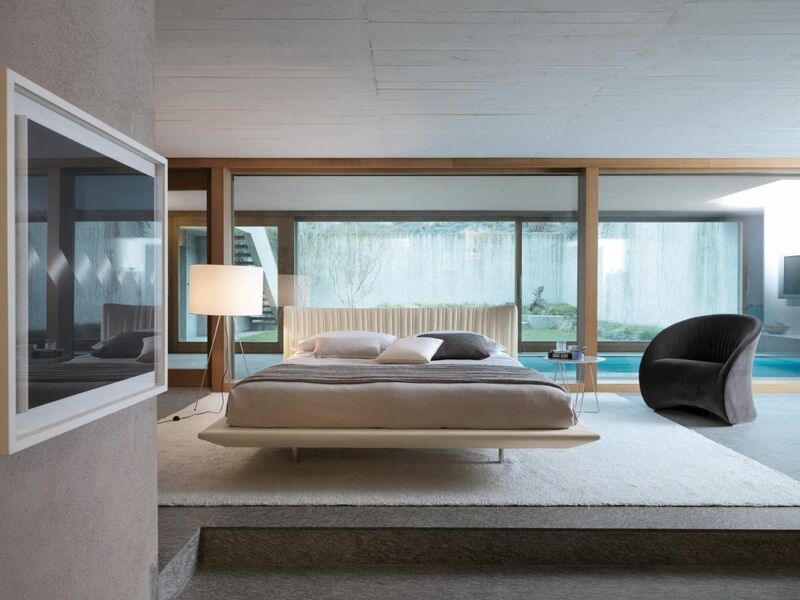 Installing a floating bed in a larger space plays up the modernist and openness of the room. Here, the patterned wall keeps the bedroom from feeling too stark. 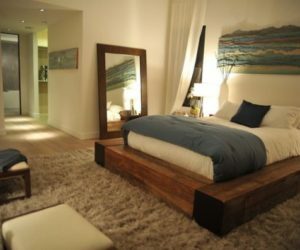 Here’s an example of a floating bed without a headboard. Because the space is more compact, the lack of a headboard or posts give it a more open feel. Even without under lighting, the bed seems to float. Regular platform beds have always been available, but their popularity surged in the 1970’s. 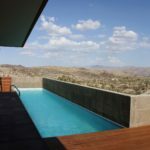 While this might be tied to increasing acceptance of modern interior design, it’s also the in the United States. 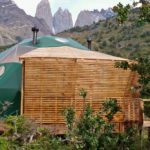 These beds use a water-filled liner as the mattress, which is nestled inside a wooden frame – a riff on the platform. 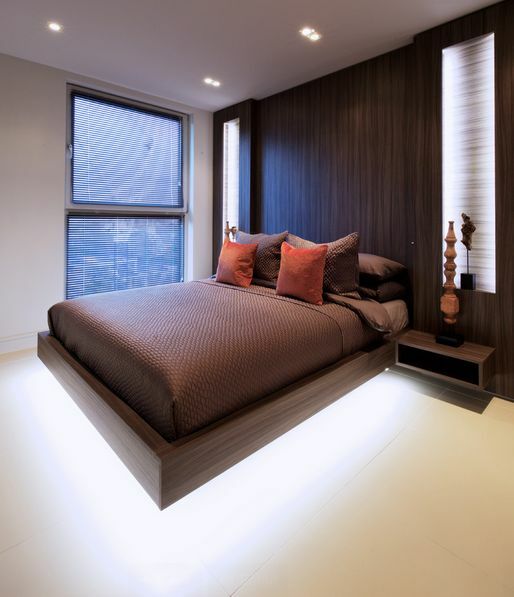 With no supports visible at all, this basic floating bed fits well in the minimalist decor that has an Asian flair. Dark wood, built in nightstands and textured bedding add up to a very masculine look for this floating bed. 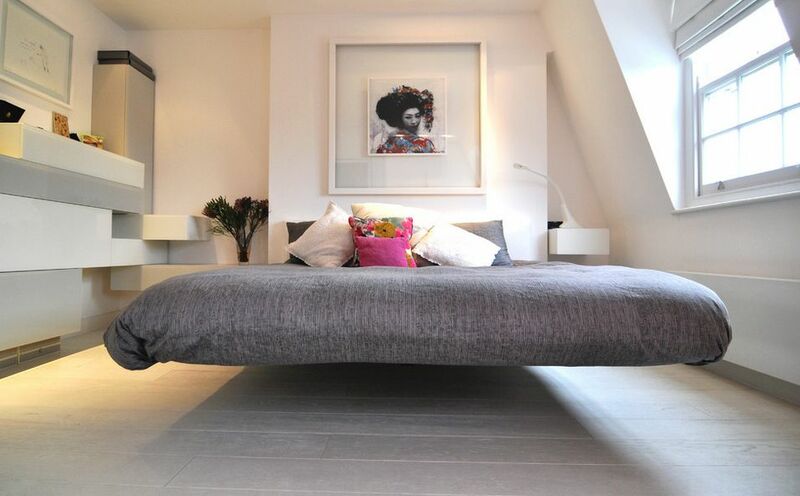 A floating bed makes a big statement in a small room, making it seem more spacious. 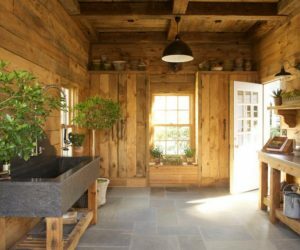 A masculine design doesn’t have to feel cold. 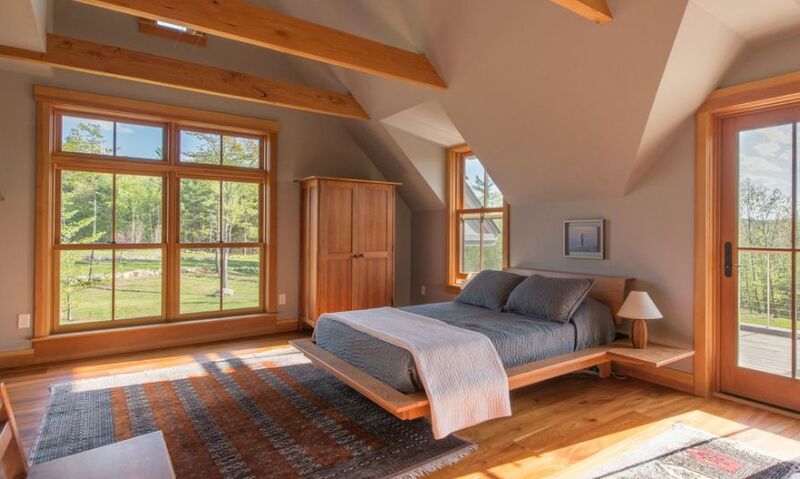 Here, honey-colored wood highlights this warm, yet very masculine bedroom where the floating bed is the focal point. 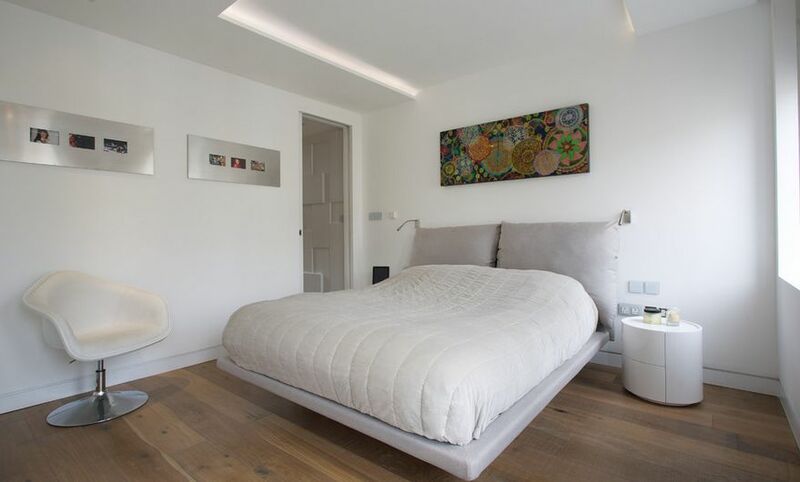 A bit lower to the ground than some other designs, this floating bed is more of a transitional design. The upholstered wall gives the room a softer feel. 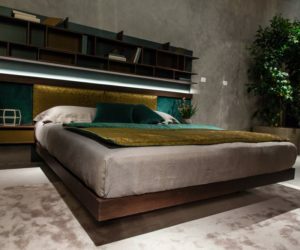 Fast forward to 2015 and designers have made creative use of advances in LED lighting to revamp the platform bed and really make it seem to float. 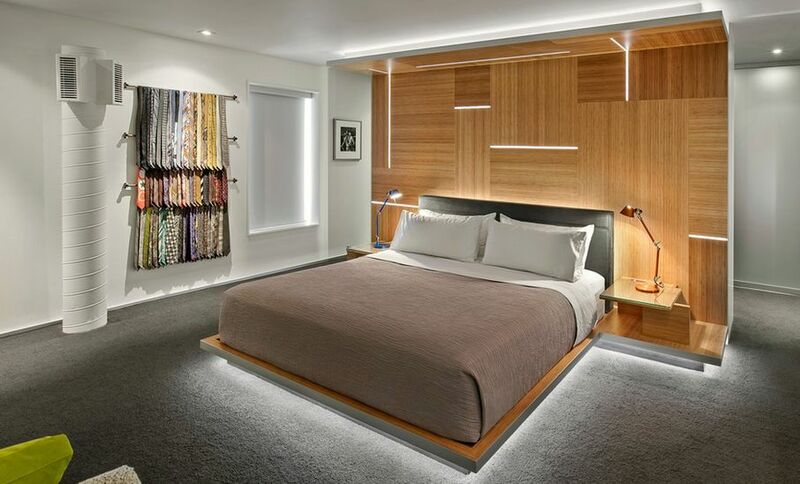 While interior designers could always have used underlighting, rope lights and today’s small, cool LED bulbs made it easier to create innovative designs. .
With no headboard and a modern room design, this particular floating bed provides the soft touch for the bedroom. 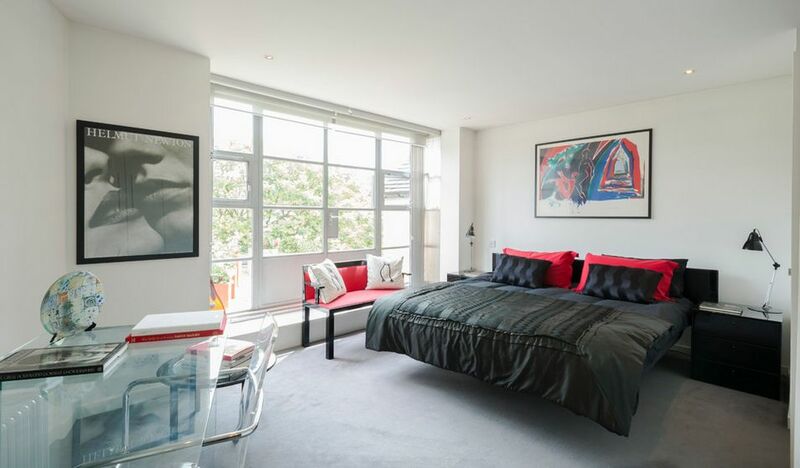 The lack of a headboard makes the striking artwork the focus of the room. This very modern black and white floating bed unit is a good example of a floating bedroom system. The bed’s platform, attached nightstands, and extended headboard wall are all one unit. Perfect for a modern room design. 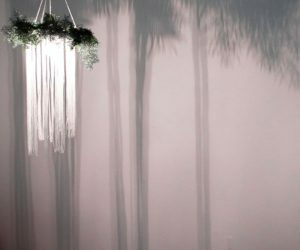 Designers achieve the illusion of floating with a variety of methods. 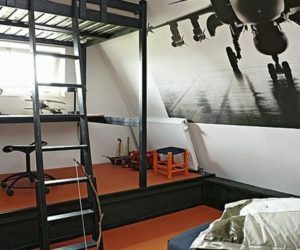 Some floating bed platforms are anchored to the wall and held up with a single support leg. Other types rest on a smaller box platform that is not readily visible when looking at the bed from around the room. 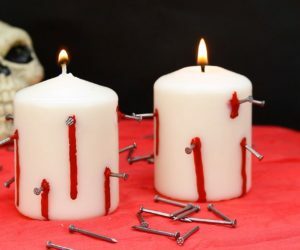 Still others use Lucite legs that are set back from the corners to add to the illusion of floating. In this setting, the modern horizontally paneled wall acts as the beds headboard, accented by the attached shelving that acts as a nightstand. Fabric pendants keep clutter off the shelving and a whimsical armchair helps warm up what might otherwise be a stark setting. 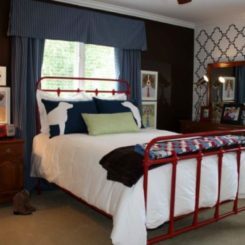 Floating beds are particularly well suited to an eclectic room setting, allowing colorful bedding and accent furniture to be the focus. 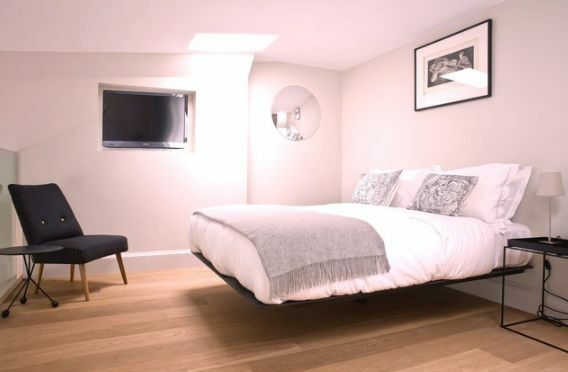 While a floating bed is indeed part of many minimalist and modern bedrooms designs, it can be the focal point of any interior design style. 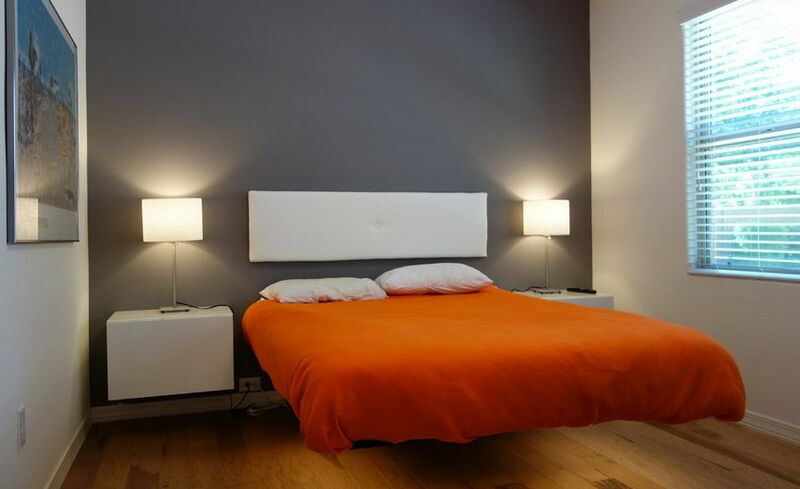 As with any piece of furniture, the material you choose for the platform and the headboard dictate the design style. 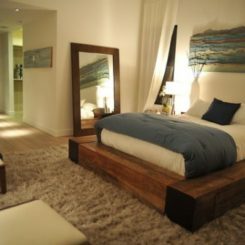 Natural or rustic-looking wood frames and headboards can make a floating bed fitting for a more traditional bedroom. 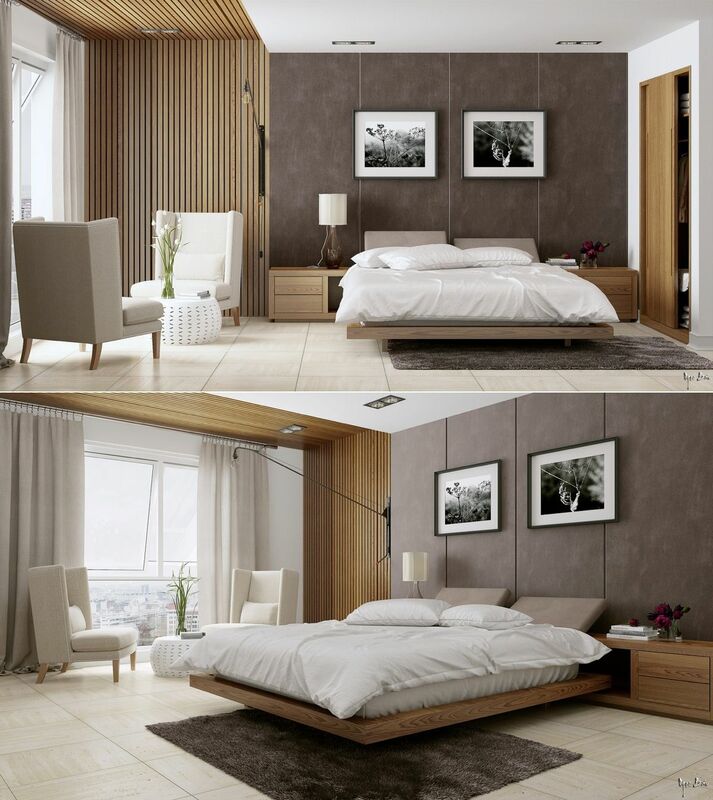 If you have a more modern style bedroom, choose sleek, polished surfaces like lacquer or laminate. For a more feminine look, upholstered headboards and platforms can soften the design. Want a more masculine look? Incorporating leather in the platform or headboard can amp up the look of the bed. A floating bed is a focal point for the bedroom, and its advantages bed are much the same as a basic platform bed. 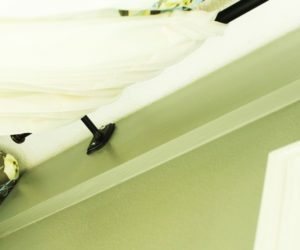 Most bed frames holding up your box spring and mattress are metal, with four to six legs, and a few cross bars for support. Because there is no box spring to support the mattress, a platform bed must have more cross supports, or even full panel support, making it studier. If you toss and turn at night, a platform bed is more stable and is less disturbing to your sleeping partner. 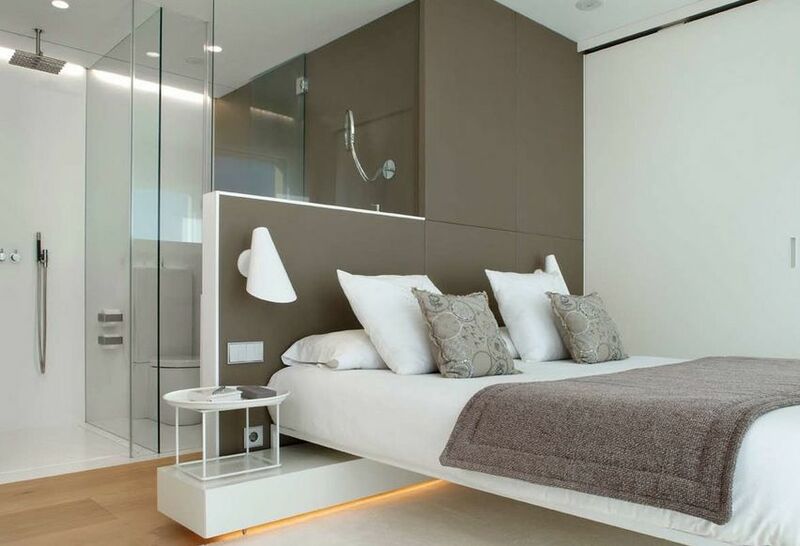 The lower profile of a platform or floating bed can really open up a space, especially if a bedroom is small. Choosing a style that lacks posts and even a headboard can save space and make for a cleaner design. More traditional looks can incorporate upholstery or mission-style frames and headboards. 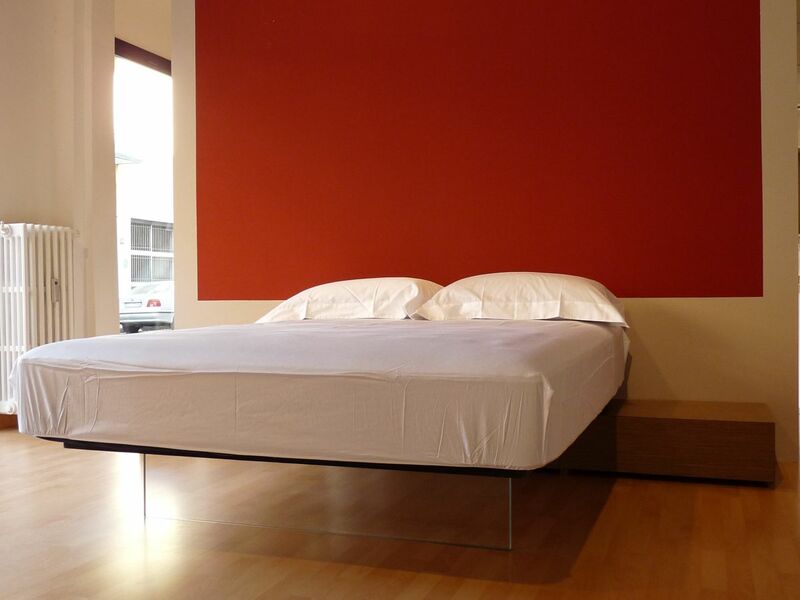 Thanks to the platform style, floating beds eliminate the expense of a box spring. 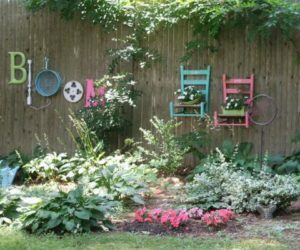 If you’re on a budget, you can get a new look at less cost. Or, the savings can go toward investing in a higher quality, new technology mattress, or a fancier platform style. If you’re thinking of doing a bedroom refresh, switching out your current bed for a floating bed design is an easy way to update your bedroom. 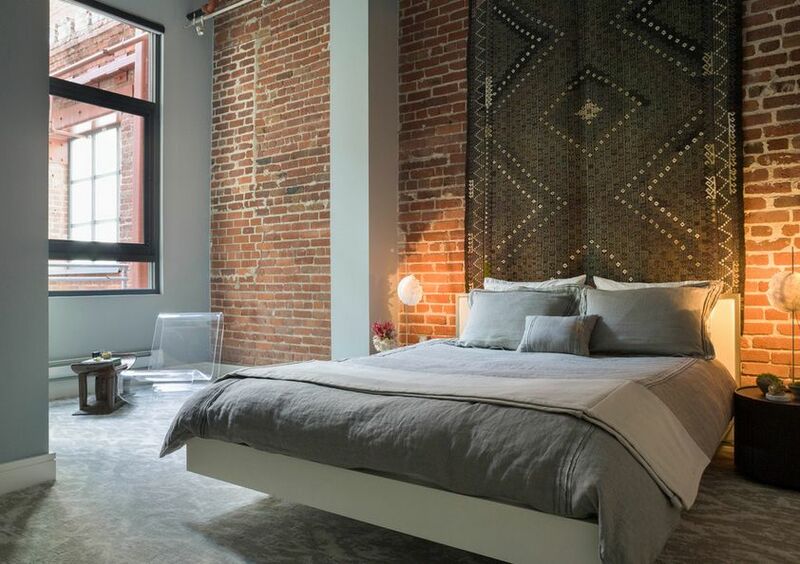 An industrial setting is the perfect place for a floating bed. 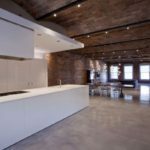 While the exposed brick wall and high ceiling are are covetable features, they could dwarf the bed and make the space seem imposing. 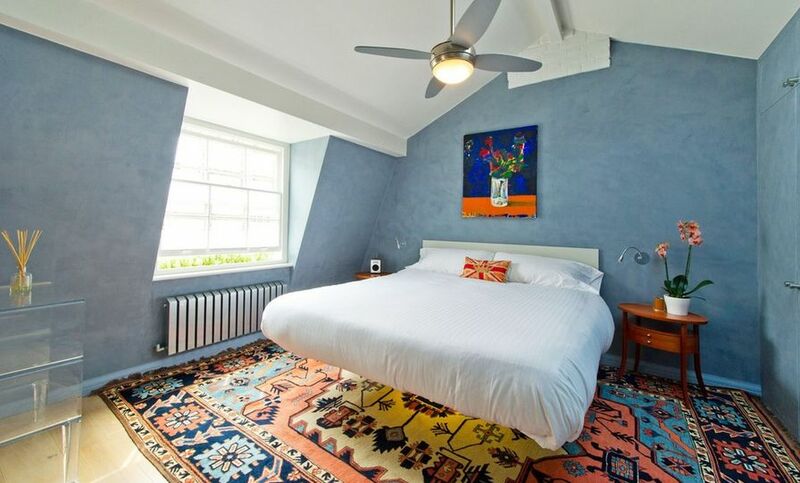 The rug hanging behind the bed warms up the room and takes the place of a headboard. 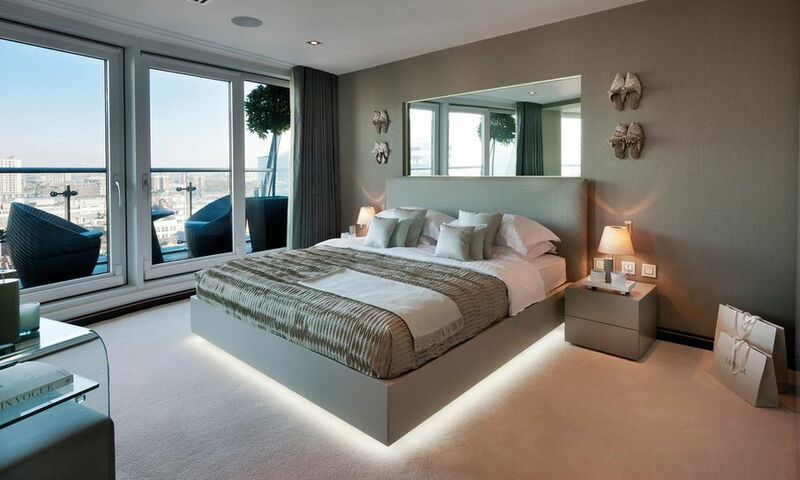 Floating beds don’t have to be large and imposing. Here’s a smaller bed that would be perfect in a children’s bedroom. 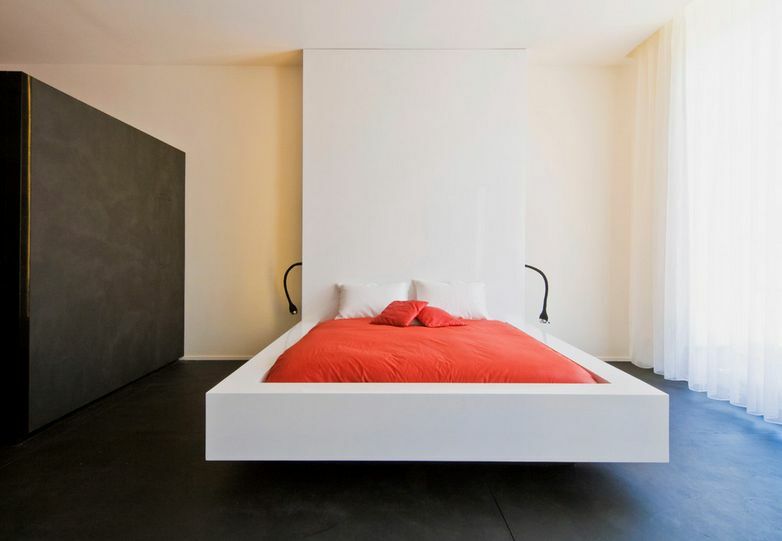 This minimalist floating bed is without a doubt the focal point of the room. 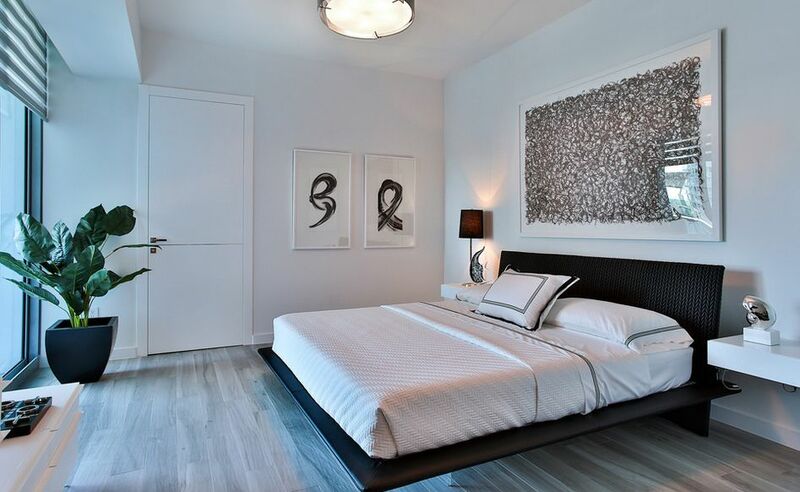 The design of the bed and attached accent wall are decidedly modern. You don’t need a modern bedroom to enjoy a floating bed design. Here the finely crafted woodwork of the floating bed and its attached nightstands highlight the traditional nature of the room’s design. 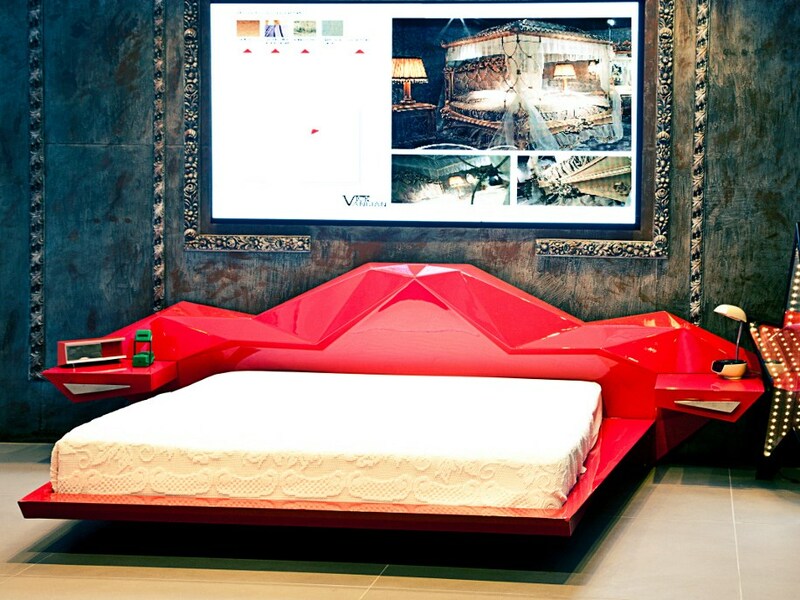 Minimalist and masculine, this bed may not be sleek but it is unmistakably modern. 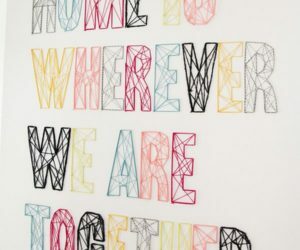 The room’s decor can either highlight the modernity, or play it down. The wide expanse of blonde wood flooring fits well with the warmer wood color of the floating bed. The geometric art and Corbusier chair round out the modern room. 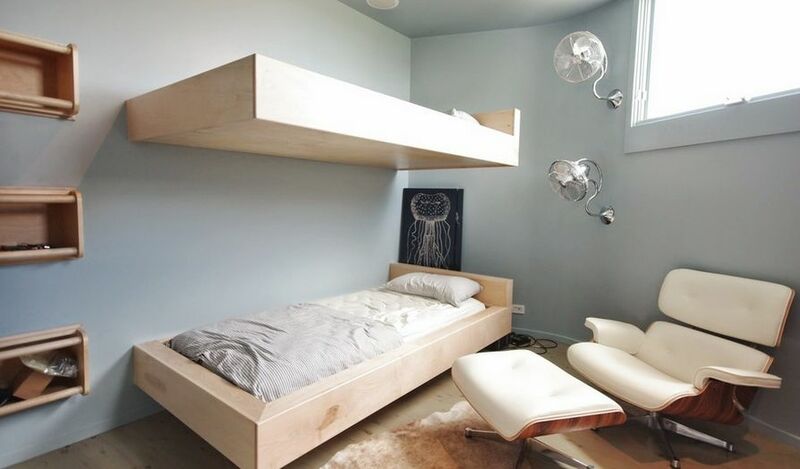 This modern floating bed also features a “floating” headboard. Placed above and not directly behind the bed, the headboard and the nightstands all seem to flow, with nothing resting on the the floor. 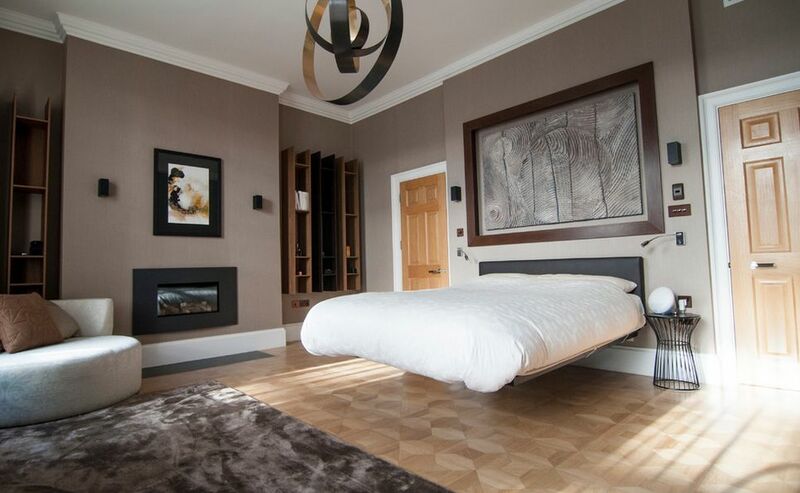 This floating bed unit is lower to the ground but does not compensate with a wider platform. 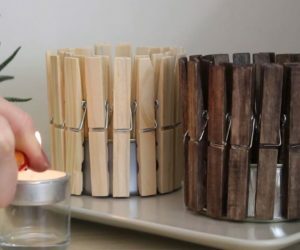 The light wood and angular look contribute to a Scandinavian feel. A small room done all in white could be a bit on the boring side, but here, the upholstered floating bed with a cushy, overstuffed headboard keep things soft and interesting. 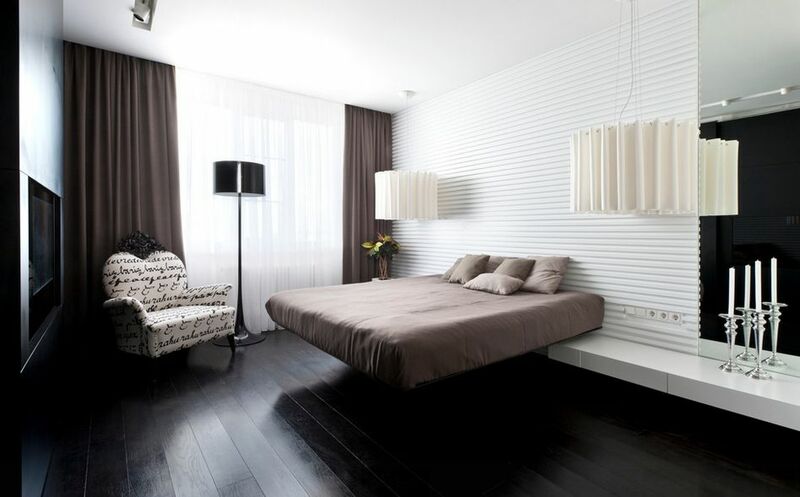 The modernity of this masculine floating bed is moderated by the textured wall panels. 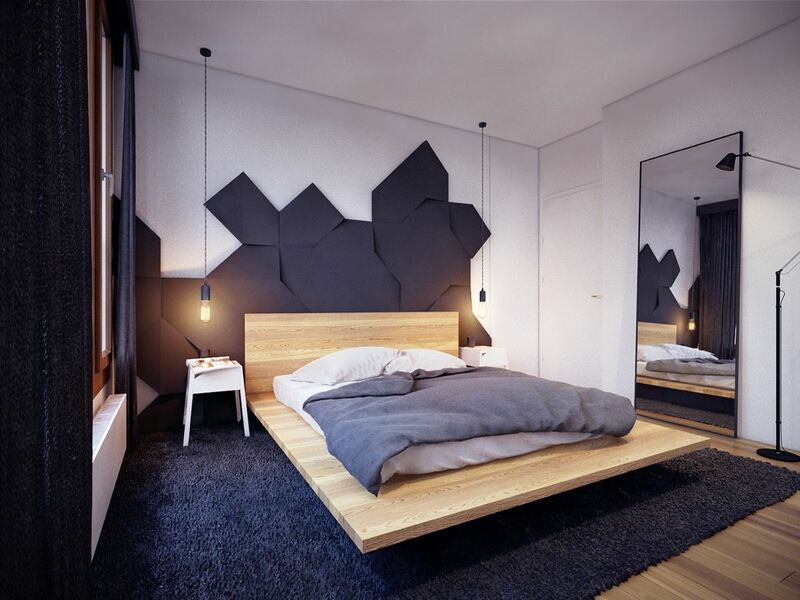 The unusual angled dual headboard lends a different look. 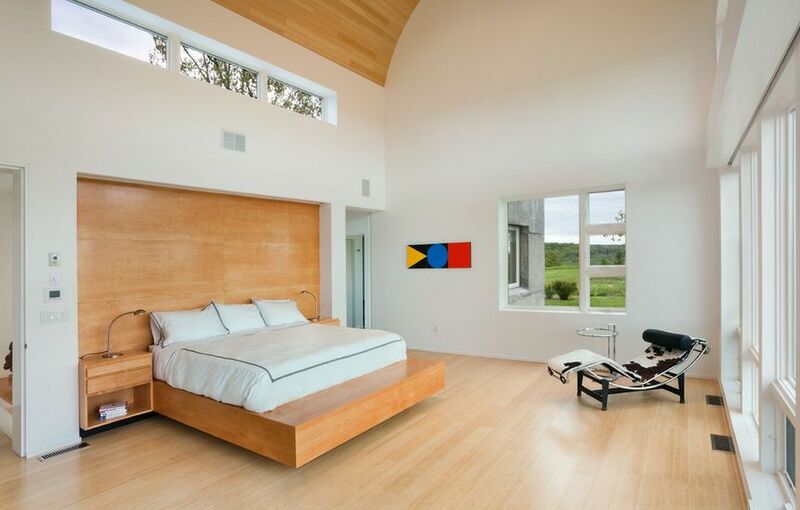 Fully modern, this floating bed made of a basic wood slab adds to the modern and geometric decor of the bedroom. 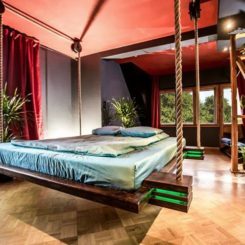 Almost like your own magic carpet, this bed seems suspended in mid air. Just looking at it makes you feel like you could float away. Set beside a large window, this bed gives you the feeling of floating thanks to the minimal leg supports that are set further in than traditional bed legs. 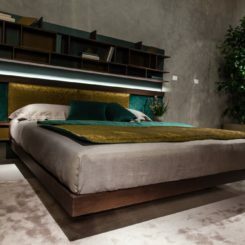 Some designers use plexiglass to support the bed in place of a traditional platform or legs, adding to the feeling of floating. No one said your floating bed needs to be completely linear. This unusual shape feels like a floating space vehicle! 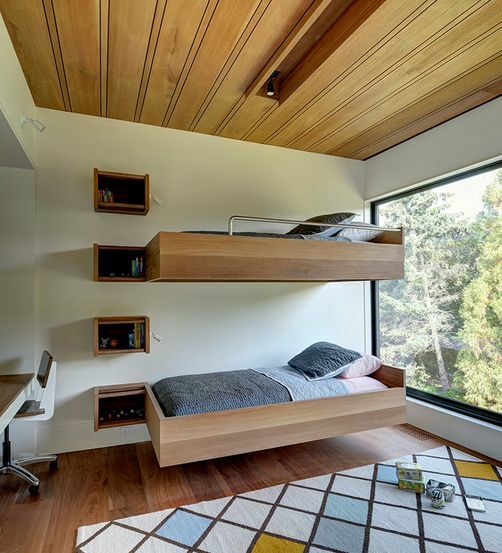 A far cry from the clunky tradition bunk bed, these floating bunk beds can help keep clutter and dust bunnies from taking over a children’s room. 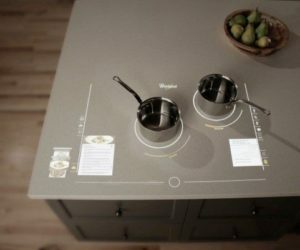 Picture sources: , , , , , , , , , , , , , , , , , , , , and .